Advanced Battery Systems is a leader in the -motive and back-up power field. We have over 25 years experience providing UPS systems, generators, industrial power backup systems, batteries, and accessories. We offer a wealth of experience, an extensive product line, and a team of highly trained experts uniquely qualified to assess your needs and configure the best solution. 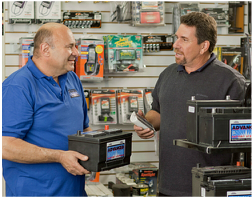 ​You can depend on Advanced Battery Systems – and trust that you’re in excellent hands. After attending CSUN Richard became the general manager of a retail battery, starter, alternator and auto electric company. After reorganizing and growing the business by over 70% over a 4 year period, Richard started what grew to become Advanced Battery Systems, Inc. (ABS) in 1986. He has been active with and served on several communities and industry boards including; The Automotive Service Council (ASC Vice President), Battery Electric Specialists Association (BESA current chairman of the Marketing Committee), American Youth Soccer Association (Board Member, Coach, Referee), Marina Del Rey Chamber of Commerce, Valley Professionals Network, Toastmasters, and many others. His graduation from the Goldman Sachs 10KSB program has help him see the company through fresh eyes and prompted the development of this growth plan and record sales growth. His hobbies are Golf, Bowling and motivational and business reading. Mike has a business and accounting degree from CSLA and an extensive management resume that includes manufacturing and cost management, sales and distribution and retail management. Mike has been with ABS since 2005 and is well respected in the battery industry. His role in sales and marketing expansion programs has paid immediate dividends. His hobbies are Golf and business reading. Steve has been active in the automotive industry for over 40 years. His extensive knowledge and uncanny ability to solve problems has made Steve a valuable mentor of the ABS team. Most people who know him considered him an industry icon. He owned his own company; Steve’s Auto Parts for over 20 years and has held management positions at several multi-million dollar automotive parts distribution companies. His new duties heading up operations have allowed Steve to utilize his skills and abilities to help streamline operations and increase profitability. He has been married to Mary for over 35 years and they have a 32 year old son named Matt. Steve loves old cars and motorcycles, he can fix anything.